Twa Afghan weemen in burqas. 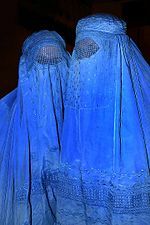 A burqa (Urdu: بُرقع‬‎) (Arabic pronunciation: [ˈbʊrqʊʕ, ˈbʊrqɑʕ]a (an aa transleeteratit burkha, bourkha, burka or burqu' frae Arabic: برقع‎ burquʻ or burqaʻ), an aa kent as chadri or paranja in Central Asie) is an envelopin ooter garment worn bi weemen in some Islamic tradeetions tae cover thair bodies when in public. This page wis last eeditit on 30 Januar 2015, at 14:46.